Told you I was gonna build it :P It just took longer than 1 day ^///^ One cool thing about is now I can store my razor nostromo insde and route the cord through it. 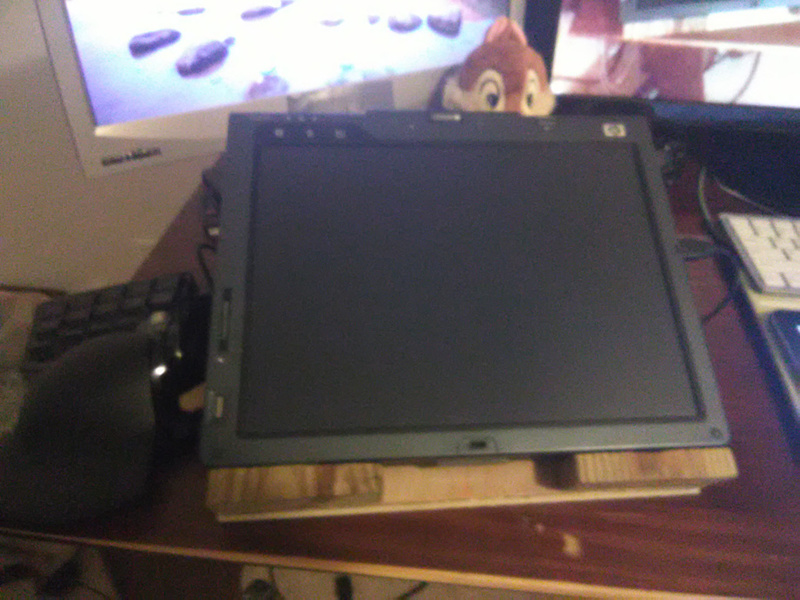 It's not adjustable, but I hardly ever adjusted my old cardboard stand anyway heh! oh man youre still using one of those? when you wanna upgrade, the elitebook 2760p is the last one i know of with that form factor and wacom screen. the elitebook 2760p has way better specs. i5 quadcore, 4gb+ram, solid state drive. same featureset and swivel, much lighter overall. I've been reading up on that one. Even saw one go on ebay for $40 -_- and missed it argh! I'll keep an eye out though! It looks like a nice lil computer to run windows 7 on. I read that it's got a max RAM size of 16gb too. yeah i still run one 2 models back, the 2730p. core2duo on this one, its showing its age. wishing i had the 2760.
hey....not a bad idea.....i think i can make one for my 27 inches cintiq....i just cant pay 500 dollars for their official stand, thanks for sharing this idea. i have the 27 inches qhd cintiq. and....yeah.....it is worth every overpriced dollar it costed me. as for the stand, yeah, i am considering a foldable beach chair like system, to adjust height on at least threee levels. and yeah....this thing is heavy as all heck. but again, worth every penny. Hmm...I thought they reduced the weight of it compared to the Cintiq 21UX ? Isn't the 27QHD like 20 lbs? Oh and you could always just buy an ergotron arm for like $140 and have it hover over your desk. the ergotorm is not avasilable in venezuela. so i must save to bring it here. Oh wow...I see. Did you have your cintiq shipped there too? My condolences on that price tag....yeeeow! Not bad! Good design for a stand. Is it only held together by glue? Yep! Just elmer's wood glue! I tried screw at first, but it started to split the wood base. So I glued a side, waited a day, glued another side, etc. It seems to be holding up pretty well so far. Not bad! If you do want to secure it with a little metal, a trip to a hardware store and a cheap hinge would probably work to reinforce those corners. Or just duct tape for a little extra skookum in case the glue starts to give..
That's a great laptop. All metal body plus glass screen make it super durable as well. I used one of those for years. Oh yeah? It's not bad for simple tasks :P Maybe even run a few NES and SNES emulators. It tends to choke at the high resolutions I use in SAI though ^^; But it's certainly not bad for sketching and inking.